Learn Chinese Mandarin characters quickly and easily. 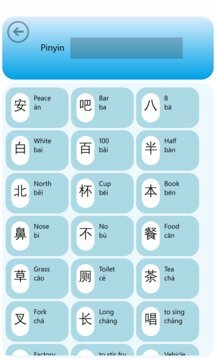 A flashcard format gives each character with pinyin, pronunciation and sample phrase. 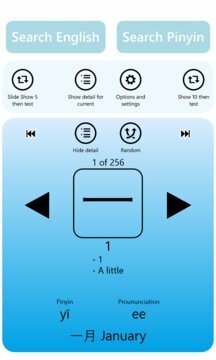 Developed to allow the rapid acquisition of core characters, it features a design optimized to facilitate quick, intuitive learning. Ideal to work through or dip into, to easily build and enhance your vocabulary. Over 300 characters. Included are two addictive quiz features and easy search facilities.